When Packman was killed, he died unmourned. The editor of a weekly paper, Packman was heartily hated by his staff, and where you have reason for hatred you may have motive for murder. There was no lack of suspects. Shortly before he died, Packman was knocked cold in his office by his chief reporter, Crompton. Davidson, another reporter, also had motive and opportunity; as had Carrington, a local author who worked on the paper. And then there were the women in the case. Lisbeth Ann did not look the sort of niece who would murder an uncle, but what about Frances Mundeham? Frances’ relationship with Packman was secret and could have been emotionally stormy; moreover, she stood to benefit under the dead man’s will. Then somebody mentioned blackmail, and two of the suspects took it as their cue to disappear. The police can put two and two together and make four. The trouble is, can they prove it? Francis Vivian’s ingenious and exciting story makes perfect reading for connoisseurs of crime. 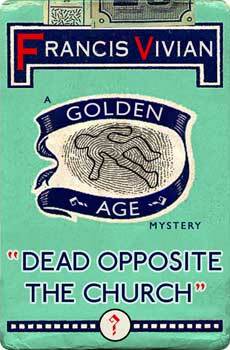 Dead Opposite the Church was originally published in 1959. This new edition features an introduction by crime fiction historian Curtis Evans.